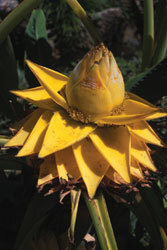 Most tropicals are perennials in their native habitat. When used in midwestern landscapes, they are basically “one timers.” They die quickly if exposed to freezing temperatures. Overwintering allows you to start out with fairly large specimens for immediate impact. Having these plants on hand can be a time and cost saver. Instead of buying new each year, consider overwintering valuable specimens. The measures you take depend on the particular plant and its value as well as the facilities you have to successfully overwinter them. 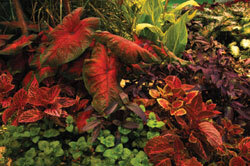 There are five basic choices when it comes to overwintering tropicals: overwinter the plant as a growing houseplant if you have proper conditions indoors; store it as a dormant plant, tuber or root; collect seed; take cuttings or leave it outside in a protected location providing it with suitable mulch or covering. When it comes time to reintroduce tropicals to the garden, wait until night temperatures remain in the 50-degree range and the soil has warmed. Cold air and cold soil keep tropicals from growing, but warm soil and air will result in plants that take off and grow unbelievably fast. Many tropicals can be overwintered as houseplants. Large specimen palms, bananas and ficus can be brought indoors and enjoyed so long as two requirements are met – high amounts of light and added humidity. Provide plants with the brightest location possible. Locate plants in high humidity areas if good light is available or group plants together. Grouping naturally raises the humidity in the vicinity. Expect some leaf loss when they are brought indoors from their outdoor location. 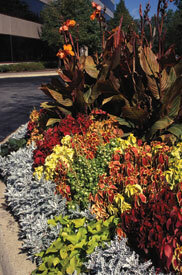 Many tropicals such as elephant ear, canna and caladium form bulbs, tubers or corms. When these plants die back, these underground structures can be dug and stored in a cool, dark place through the winter. The best time to dig the bulbs and tubers is after a light frost has killed the tops back. Trim the stems down to 4-6 inches and dig the plant up. Allow the tubers to dry slightly for a day or so before storing. Place the tubers in a crate or box with ventilation holes and bury the tubers in peat moss or wood shavings. Place the box in a cool (45-50 degree), dark area. Inspect the tubers regularly through the winter checking for rotting or excessive shrinkage. If tubers are drying out, add just a small amount of moisture to the peat. About 4-6 weeks before the last frost in the spring, pot the dormant tubers and place them in a warm, sunny area. This will give you a head start on having some tropical transplants for your garden. These are some of the easiest tropicals to overwinter. Overwintered bananas can become extremely large and even more exotic the following season. If the banana is container grown, cut the plant down to about 4-6 inches just before you bring it indoors. Store the container in a cool (45-50 degree), dark area. Keep the soil dry. In the spring, increase watering and a new shoot will push up from the center of the stem. Place outdoors after frost when temperatures start to warm. If the banana was grown in the ground, dig it up before frost. Leave the soil around the roots and wrap the root ball in a plastic bag. Do not cut the plant back. Store the plant in a cool, dark location. The stem will dry down naturally. In the spring, cut the old stem off and replant after danger of frost is past.